lilac, and a strip of a plastic card. - copper (in Finland e.g. old copper coins were hammered into needles), aluminum (in Finland aluminium spoons were used to make needles; also airplane aluminium in wartime; note that some people say aluminium may stain white yarn), iron, silver, old metal (nail) file, hair clip (use the narrower end as the tip of needle). Also a strip cut off an old credit card or other plastic card may do as a needle replacement, although the thin plastic strip is quite floppy, and the edges cut with scissors feel a bit rough in one's hands. You can use an ordinary paper puncher to make the needle eye. Wood used in ice cream sticks tends to feel rather soft and it splits easily, and it might be a good idea to sand down the edges carefully so that you won't get small sticks into your fingers later. I wonder if using a nail polish on the edges might help. Just like juniper, lilac feels tough and durable material which is easy to polish into a smooth needle that nicely runs through your nalbinding work. On the photo on the top, the fourth needle from the left, is an old nalbinding needle made of aluminium which I got as a present. The needle tip is quite sharp/pointy, and therefore that needle suits perfectly for those nalbinding stitches in which you pick up from behind the thumb a split yarn, for example Finnish Stitch 1+2½ (1 loop stays around thumb, 2 loops onto needle, plus insert the needle in between the plies of a 3rd loop). If you look carefully at that needle, you may notice there is a slight groove from the eye to the end of the needle. I have seen similar grooves in wooden needles, too. The groove makes the end of the needle thinner, which makes it easier to pull the needle and the yarn through the stitches. Nalbinding needle is usually quite a large one. In Finland the lenght of the nalbinding needles seem to have been most commonly about 8 to 12 cm, but there have been old needles up to 15 cm long. Older people say the "lenght of one's forefinger" is a good measure, and then you can support the needle against the palm of your hand while working. Some people prefer shorter needles, however, about 5 cm. The width of the needle varies from about 0.4 to 1 cm at the widest part, and usually the needle is flat so the thinner edge is about 2 to 3 mm. Metal needles seem to have been narrower and thinner than wooden ones. There are needles of different shapes, some are quite pointy at the tip while others are more of the same width all through. The tip may be straight or slightly curvy. Curve makes picking up the stitches bit easier, but after all it is a matter of personal preferences which kind of needle to choose or make. There is usually one eye at the end of the needle, or in the middlish. Eye may be round, oval, or longish. The shape and placement of the eye does not matter much, but again, choose the needle that best fits in your hand. If you prefer working with longer lengths of yarn, oval and longish eyes can accomodate more yarn (folded in several folds). The eye can be a smaller one, too, and you can "finger crochet" (haahlaaminen in Finnish) the yarn into large, about 30 cm long loops, so it becomes shorter and easier to handle. 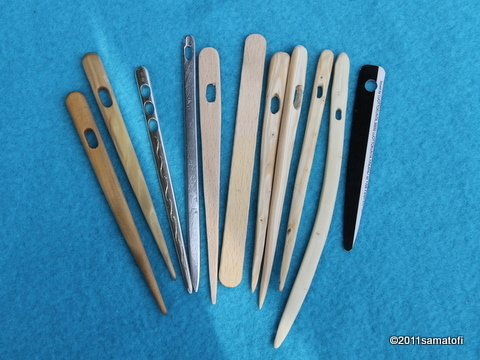 There are also nalbinding needles with an eye at both ends of the needle (double eyed needles), and you can choose which end you prefer to use. Toini-Inkeri Kaukonen writes in her article (1960) that there is information on two- and three-eyed nalbinding needles in Finland only, but there are old two-eyed needles in museums elsewhere, too. Kaukonen writes that in the national nalbinding survey in 1957, there were two answers in which the two- or three-eyed needles were mentioned, but apparently there weren't any detailed explanations included in the answers, because Kaukonen is not sure how they were used, and guesses they may have been used when working with more than one colour. On the other hand, some think the multi-eyed needles may have been used for some other technique. On the English Nalbinding group some suggested that a long piece of yarn could be folded into not only one zig zag bundle but into two (or three) folded bundles. I had a three-eyed needle made for me, and that does seem to work well in stacking the yarn. Also in the German Nadelbindung group some people have tested the multi-eyed needles, and they think the needle and yarn run smoother. 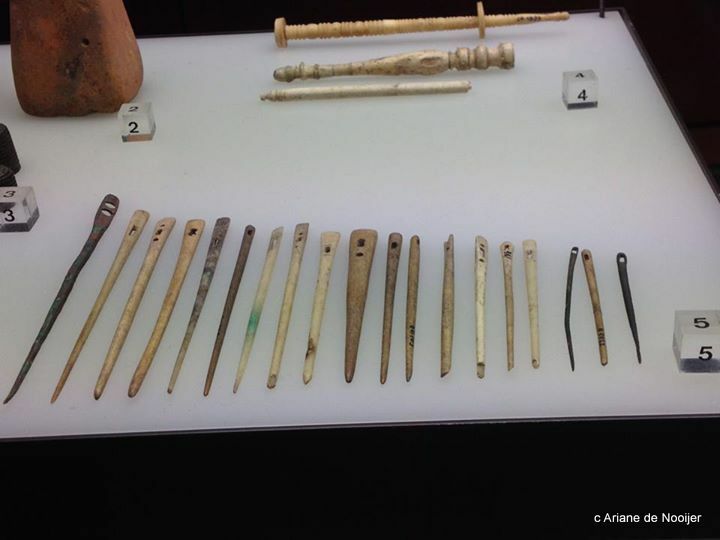 There are multi-eyed needles from the Roman era (photo1, photo2) - and maybe from other places and eras as well. 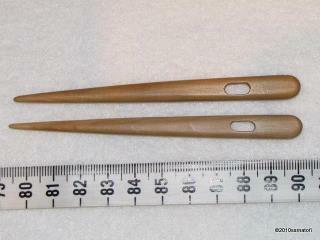 The Roman needles, we do not know whether they have been used for nalbinding or for some other purpose, since there aren't nalbinding finds to support that, but the size (12.5 cm) would be similar to those needled we know have been used for nalbinding.